BART are excited to announce the 2017 Bristol Avon WaterBlitz, a campaign to collect as many water quality samples as possible in one week from the Bristol Avon and its tributaries. 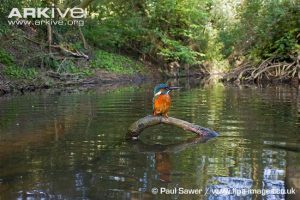 Taking place from 10th – 16th June to coincide with the festival of nature, the project will gain an invaluable snapshot of the health of our rivers that will help to direct future conservation efforts. Thanks to funding from the Bristol Avon Catchment Partnership and the Greggs Foundation, BART is working in partnership with FreshWater Watch, a global citizen science programme developed by the environmental NGO, Earthwatch Institute. BART are asking individuals and community groups to take part and help to collect at least 250 water quality samples within the Bristol Avon catchment, including Bristol, Bath, South Gloucestershire, Wiltshire and North East Somerset. Participants will use simple colour dip tests to determine the concentration of phosphates and nitrates in the rivers, which are naturally occurring chemicals but can be increased by man-made pollution. In high concentrations these chemicals affect the water quality, degrading river ecosystems and harming the widlife which relies on the river. The data collected during the Bristol Avon WaterBlitz will be used by in Earthwatch research into the state of the world’s freshwater systems and by BART to plan local improvements. Using the free water quality test is quick and easy to do, and all volunteers have to do is sample their chosen river or stream in the Bristol Avon catchment and upload the results to the Freshwater Watch website. On the website you can compare the water quality in your sample to other sites on an interactive results map. BART are encouraging people to show us how they’re getting involved during the WaterBlitz week by sharing a picture or video of you sampling on Twitter using #BAWaterBlitz. You will then be sent your free water sampling kit by post. Please contact claire@bristolavonriverstrust.org with any questions. BART regularly receive emails from local community groups who are doing fantastic work around their stretch of river but are unsure of how to deal with woody debris within the channel. Many people are prone to remove it in order to ‘tidy’ rivers, however woody debris is a vital component of our watercourses and its removal can severely degrade their health. 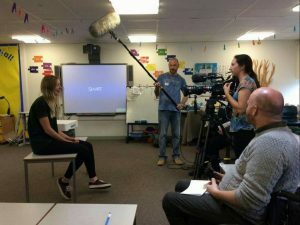 Following the huge success of our first Eel in the Classroom project last year, BART have embarked on the even greater challenge of delivering the project in 6 different schools across Bristol, Wiltshire, and Somerset. 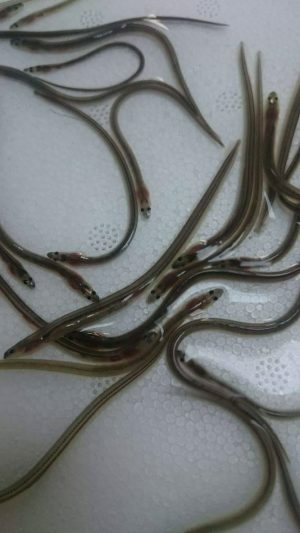 After being caught by elver fisherman, the elvers (young eels) were donated to UK Glass Eels in Gloucester. 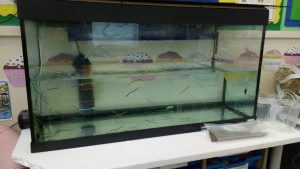 From there approximately 100 eels were installed into the tanks in each school. Each class of children will rear the European eels for the term, feeding them every day and learning about all aspects of their lives. At the end of the 5 weeks each school will have a release event, where the children will release the eels back into their local river. They caused a lot of excitement! 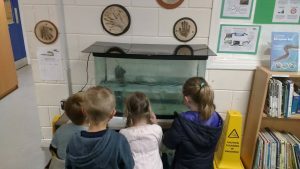 Before the eels were brought into the schools, we had a lot of interesting and inventive guesses from the children as to what creatures would be going into the tanks set up in their classrooms. Ranging from whales to swimming chickens and self-juggling bananas, none of the children guessed that they would be looking after 100 elvers! Once the elvers were in the tanks we had so many questions from the children, about the life cycle of the eels, where they are from and what they eat. Some of the more interesting questions included can eels talk to each other, and can eels cry? We are yet to find the answers! The children will learn all about the fascinating life history of the eel, and the current issues they face causing them to be designated as a critically endangered species. Eels are thought to spawn in the Sargasso Sea in the North Atlantic ocean, before they float in their larval form on ocean currents towards Europe. Once they reach the freshwater estuaries around the coast, they morph into elvers and swim up into rivers where they spend up to 20 years living and feeding. Once they have grown and matured, they swim back to the Sargasso Sea where they lay their eggs. The number of European eels which reach Europe has decreased by between 90 – 98% since the 1970’s, due to numerous factors all of which are human induced. Things like weirs, tidal gates and dams all act as barriers to migration as the eels swim up-river, and pollution, climate change, overfishing and habitat loss all have a negative impact on eel survival. Hopefully this project will inspire the children to take action for rivers in the future, not just for the survival of eels, but for the health of all wildlife which depends on the river and marine environment. 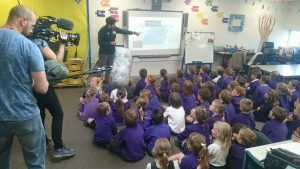 We even got a taste of stardom when we were joined by the BBC in St Andrew’s Primary School, Congresbury, who filmed some of the action for their 2017 series on wildlife in the Westcountry. Thank you to Bristol Water for funding the eels and equipment, and to the Sustainable Eel Group and UK Glass Eels for their support. Watch this space to find out more about how the schools get on with their eels!